I have always loved walking around the UC Davis Arboretum. It was well established when I was a graduate student in the late 1980s, and even then it had a serious water quality problem in Putah Creek. The algae and other problems caused duck die offs and some stinky stretches. Now with a new design to help clean up Putah Creek, you can actually see the turtles swimming in the creek. The redwood grove has new plantings on the floor, and the new trailhead in downtown Davis is complete. If you haven’t been in a while, it is worthy of another look. The new infrastructure in the creek helps to keep the water clean. Plus it introduces the sound of running water to your walk along the trail. You will get a healthy 3.5 miles of steps if you walk the entire loop. Along the way you’ll enjoy over 20 gardens, interesting bridges and paths and only occasional glimpses of campus life. I’m sure it’s kept many a student sane. Watch for slider turtles. The iNaturalist app suggests this is a painted slider. I belong to the Arboretum so I learn about their plant sales and enjoy a discount. The Arboretum is free of charge. Most days you’ll have to pay for campus parking if you are starting from the oak grove side near the medical campus, so instead park behind Mikuni’s restaurant (by the closed Whole Foods). When you finish up you can enjoy a meal at Pluto’s or Mikuni’s. I’m taking my grandson on Friday! Trailhead accessible at end of D Street, in downtown Davis. Put “Arboretum GATEway Garden” into Google Maps. Needing to learn some basics about photography I called my friend Bill Reid to give me some pointers. He invited me to the Yolo County Art and Ag Project. 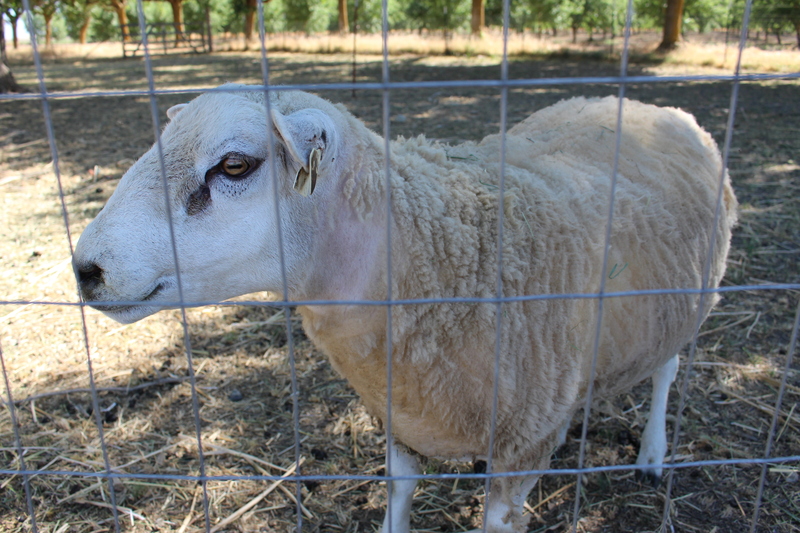 We left Davis early on Saturday morning and made our way to Chowdown Farm near Esparto. 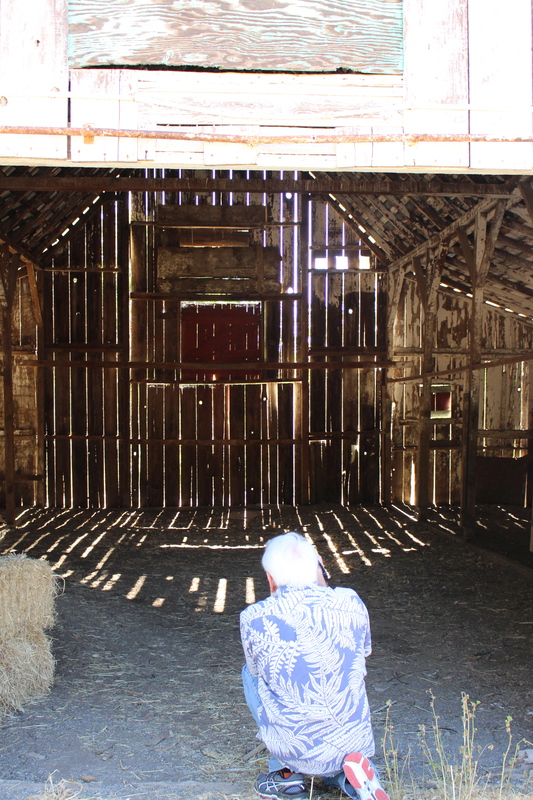 Bill Reid taking a photo of the classic barn at Chowdown Farm. After the frustration of watching the video tutorial for the Canon Rebel T5i (narration so quick it may as well as been in Spanish), getting a private coaching session with Bill empowered me to take lots of photos and try different camera settings. The farm had handsome Dorper sheep, a hardy breed from South Africa, interesting trees and outbuildings including a classic barn. 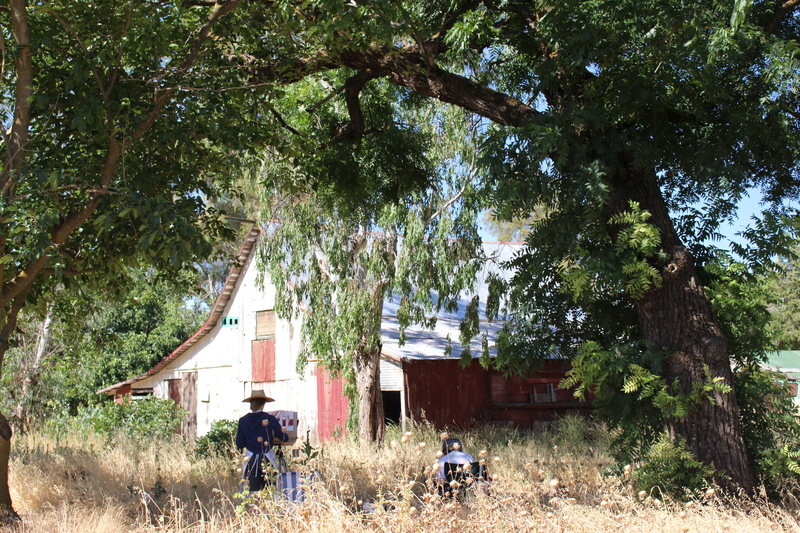 It was very kind of the farmer Brian to open up the property to painters and photographers through the Art and Ag Project. My camera is sufficient quality to challenge me for a very long time. Fortunately it also has an automatic setting that takes super pictures without any effort. When we returned to Davis I downloaded my photos and I was very satisfied. We also watched a video from YouTube (YEAH for YouTube videos!). I bought this camera to be able to supply better pictures for this blog. Hopefully with the “burst” feature (taking several photos a second) and the lenses I will be able to bring you the color of le Tour de France. Compared to most of the Northern Hemisphere, the weather in NorCal has been balmy. For this weather wimp it has been too cold to ride… in my current bike kit, in this wind, and so on. I opened up the January-February issue of Bicycling magazine and read several inspiring stories including “Conquer Your Mountain” on page 18 by James Herrera. Step One is to identify your goal. My big goal is to follow the Tour de France and to ride on a Trek Tour through the first stages in England. Step Two is to make a plan. I have the tour and hotel reservations done for the Tour de France. The harder part is learning to ride well enough and be fit enough to enjoy the experience. July 2014 seems so far away, so I am making a lot of excuses and not riding any miles lately. Step Three is to tell the world. 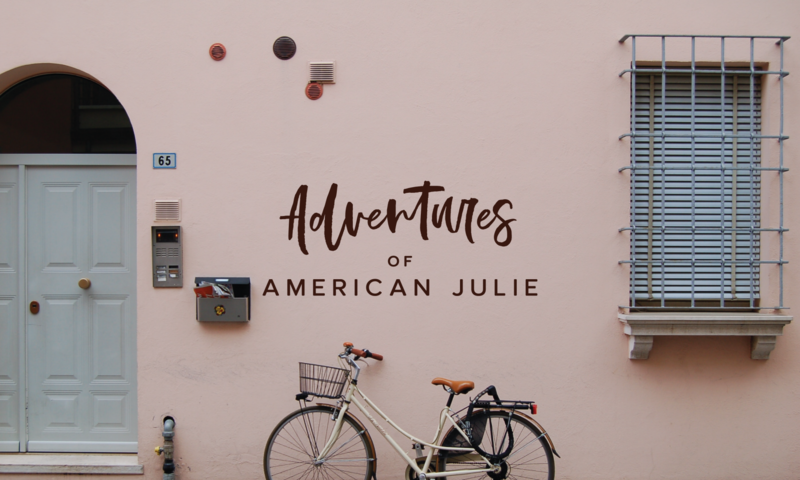 Okay, so this blog is not the world, but you are willing to stand in for “the world”, right? I realized that I needed to set some very short term goals, like 2 weeks at a time, to stay on track with my big goal. 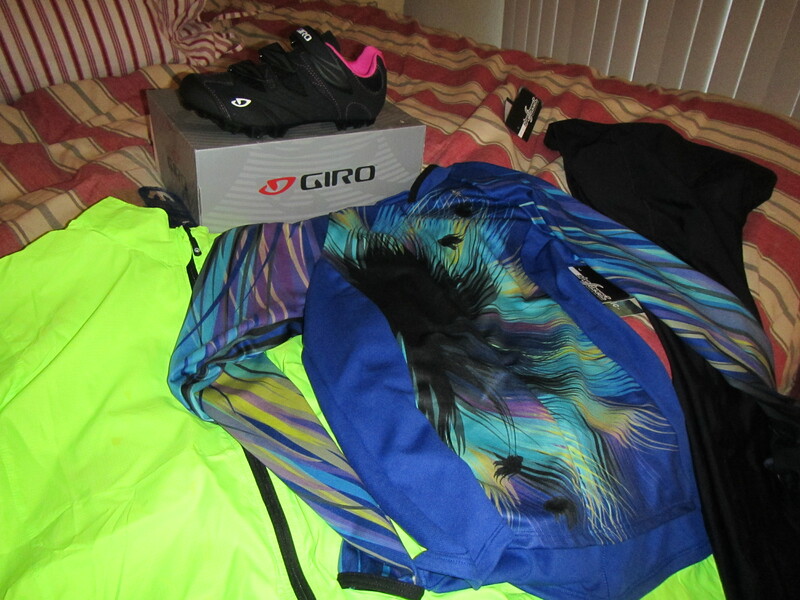 Even before I could do that I had to go to the bike store and buy some winter riding gear. I do not like trying on kit because it is all so unfamiliar. It feels like just yesterday I bought my first pair of bike shorts; and with the long Indian summer they worked well until about mid-November. Off I went to B&L bike shop in Davis because they have a good selection without an overwhelming number of choices. Jenna helped me find tights, a long sleeve jersey and a windbreaker. I also bought mountain bike shoes for another short term goal: learning to use clipless pedals. I made my purchases on Wednesday, so when do you think I tried it all out? That same day? The next morning? Not until Saturday morning! I will not bore you with all the reasons. Never been too worried about being matchy-matchy; more interested in visibility on the road. Finally I got on my bike and I rode from 8:45 to 9:22 a.m. I planned to be out the door at 8:00 a.m. but the sun was still creeping up and it was bitter cold. So I waited a few more minutes and then coached myself. How important is my Tour de France goal? Very big deal. So get on your damn bike and get cold. Step Four is track your progress. There are so many apps to do this. I like Map My RIde for knowing how far I biked and then I make notes in my old fashioned paper journal. Finally, step six to achieving success is put in the effort. Okay, okay. No more excuses.